Think back to the wonderful day you were diagnosed with Type One. Ah, what lovely memories. The smell of hospital detergent, the sinking feeling in your belly as you realised with a dread chill that your life would never be the same; the moderately caring but slightly detached consultant; wondering what the hell diabetes was and how long you had to live. Such happy days. After the initial shock you would – hopefully – be given a crash-course to teach you how to stand in for your pancreas, now that the stupid bloody thing had decided to conk out on you. Weighted down with leaflets about driving with diabetes, drinking with diabetes, eating with diabetes and booklets detailing the thrills and spills of peripheral neuropathy you would have probably be issued with one of these little beauties, the almost completely ubiquitous Optium Xceed. 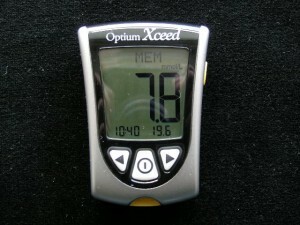 The Optium Xceed is the AK47 assault rifle of the blood-glucose meter world. Simple to use, easily available, known all the world round and standard issue to the newly-diagnosed. While quite a lot of us gadget-obsessed geeks have moved on to something slightly more sophisticated, I bet pretty much all of us have one of these in a bottom-drawer somewhere if they’re not in actual active use. The main reason for the Xceed still hanging around is that it’s one of the very few meters that can check for ketones. I’m probably a negligent diabetic but I never, ever, ever, ever check my ketones. I know I’m diabetic (obviously), I know sometimes my blood glucose goes high (obviously) and I know that, as sure as day follows breakfast, that I will sometimes produce ketones when I’m high. I don’t really need a meter to tell me something so strikingly obvious aside the occasional exceptional emergency. Though saying that, I do own an Oregon weather station that tells me it’s raining outside (it does a lot of that in Scotland) when I could simply look out of the window. I didn’t need that meter to tell me that but I still have it. So maybe, the whole ketone measuring thing does have a place after all. Or maybe they’re just pandering to the lunatics who adhere to the late, lamentable Atkins’ diet; who calculate the diet isn’t working unless they’re producing ketones. Nutters. Anyway, getting down to blood glucose measuring itself, the meter needs to be calibrated with each new set of test strips, which is a bit of pain. The test strips themselves come individually foil-wrapped, which I’m sure is great for something but the extra unwrapping just annoyingly adds another step to the tedium of testing. Also your bag also soon fills up with a tonne more crap compared to other meters. The strips themselves are relatively slurpy, require quite a small sample of 0.3µL and tests take 5 seconds. All in all not world class, but acceptable. Just. Moving on down the specifications list, it has a 450-test memory and 7, 14 and 30 day averaging. You can also download your results to your computer, should you choose too. So, if it wasn’t for the ketone measuring thing, this meter would be consigned to the bin. But because of the ketone-thing and the fact I once saw this model on an episode of BBC’s Casualty when they had some poor bloke falling into a diabetic coma, or something, on an episode – I nudged my wife excitedly, “I’ve got one of them!” So for that reason alone it deserves to remain in the drawer with some out of date test strips for emergency use. Eagle eyed readers will note that this is a re-post of an old review – however, it’s been extensively revamped, because the original review didn’t mention keytone testing! I like my ubiquitous Optium Xceed, it just does the job. I have used the ketones testing when I had a bad reaction to some prescribed drugs last year and was vomitting hourly. The ketone numbers on the meter were much better than trying to track them via colours on a urine stick. I could see ketones rising, but couldn’t keep enough food, liquid or hypostop gel down to fix the problem. I took myself to hospital in the end because a drip was the only way to sort it. I feel left out! 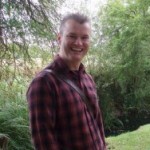 – I never had one.. when I was newly diagnosed I was given a pot of BM test strips and some cotton wool. The medieval finger pricker that went with (autolet?) was harsh, you had to squeeze out a pint of blood to put on the test strip, time one (or was it 2?) minute(s), wipe it off with the cotton wool and wait another one/two minute(s) for the result – high tech indeed. Oh, and then hold the used test strip up to the side of the pot it came in and guess the colour change to correspond with a guesstimate blood sugar level. @Charlie Ah, those were the days, the 2 minute blood test followed by the 10 minute family debate on what the result was as everyone thought it was a slightly different colour! I’m also not sure why the picture isn’t displaying properly – it should be in a little box to the right of the article. It doesn’t seem to parsing the HTML correctly – how odd. If the Abbot Optium Exceed is the AK47 of the BG meter world, My Accu-Chek Compact Plus must be the 105mm light gun! I never had an Optium Exceed though, when I was diagnosed T2 I was told I would have to watch my diet and that’s what I did. The first meter I had was a second hand one and I seem to remember that taking two minutes or so to test, but when my feet started turning into turnips I realised testing was essential and got some serious kit. I think my first proper meter was an Accu-Chek of some sort and I’ve staid with the Roche stuff since, coz it’s big, black and butch! Ah, the BM stick challenge – I don’t think the result was even definitive once you’d matched your colours – it was ‘below 2’ or ‘3-4.5’, ‘5-7’ or something wasn’t it? I remember the high colours were much prettier, lucky for me. And when I finally got a meter in the early 90s (or somewhen) it was enormous – called a ‘Rentokil’ or something. It was the size of about 7 Optium Xceeds next to and on top of each other. @Tim – the eagle eyed amongst us have noticed more than just that, but are too polite to say anything. Well if @tim has ak47 and @teloz has a 105mm, my accu chek aviva nano would struggle to be a water pistol!! Damn thing! Since 2005, I’ve been butchering along merrily with an Accu-Chek Active (as far as weapons go, a Christmas cracker, but I’m eagerly awaiting that Swiss army knife of Bayer). @caroline: Did the Rentokil fend for itself, like one of these? Come on Medtronic, bring on the Poopy Pump! Yes, I remember the BM sticks. Used to have to cut them in two in order to make them go further, as the doctor wouldnt give me enough – back then the strips didnt have any fancy technology in them, just a block of colour reactive stuff. Then got a meter the size of a house brick that read them – but didnt take half strips. Had to badger the doctor to let me have more strips. Used that for years until it finally broke! There’s a review of its crapper brother – the Freedom Lite – coming on Wednesday. Something to look forward to review fans! I had one of these stolen from my bag when I was out one evening- I wonder if some guy is still trying to work out what it is/regretting that he was unfortunate to steal the most bog standard meter in the UK! However, it does exactly what I need it to (and not much else)- I’ve never really got on with the fancier meters- perhaps I’m just stuck in my ways! @teloz – you and your Compact Plus – they’re rubbish, mate, rubbish! When i got my pump with meter remote, my husband commented that the meter should have the capability to text someone your exact whereabouts if your result shows up lower than a set level so that they can call/check you’re ok. Sadly, it was definitely a guy- a stereotypical one at that! I think it’s unlikely he was a specific blood testing kit theif and probably thought it was a new mp3 player- as people often think about my insulin pump as they yank it out of my pocket to have a look! I found the Islet iphone app pretty cool but never managed to keep it up after the initial novelty had worn off. Has anyone found an app that is insulin pump compatible- i.e. you can input basal rates? Some of the carb counters have been useful for calculating insulin doses- although they all seem rather geared towards American foods (although I’m not sure any nationality considers a “portion of cornstarch” to constitute a meal!). @teloz That’s the best definition of an iPhone I’ve heard yet! @alison @teloz – couldn’t agree more. it’s just a small computer which forces you to buy all your guff through evil iTunes. I just don’t get it. (Handbrake turn, squealing wheels etc) Back (nearly) on topic, I swear by my Accuchek aviva combo. Mainly cos its the one that talks to my pump and does all my bolus wizard stuff and no other can do that (ie talk to my pump). But it doesnt do ceratin things which would be quite nice (ie allow me to put blood onto it from any angle – its very picky where my finger is with regards to the test strip end) and a light would be quite nice, as would ketone testing! @Tim – There’s always some so-and-so who drifts off topic; strapped to the gun-carriage wheel, sixteen lashes and the salt rubbed in, that’s what I say! Totally agreed @Teloz. The manufacturers give the meters free gratis to the clinics to hand out like sweeties, so that the poor consumer (and the consumer’s payment provider) is reliant on them providing the strips and taking the money (at least the NHS pay for the strips here in the UK). If they’d stop making fancy new meters and start reducing the cost of strips, we’d all be better off (including those T2s who are still restricted in how many strips they are ‘allowed’) except the manufacturer. @annette @teloz – I do agree that meter manufacturers are the crack-dealers of the diabetes world – they give you your first hit free and then screw you (or the NHS) for the test strips. However, I don’t think there’s anything wrong with better meters being designed and introduced. Would you prefer to use one of those ancient blood-curdling meters Alison burbles on about from time to time, or a nice meter that only needs a tiny drop of blood? Hmm? Hmm? I couldn’t get that huge meter that I used to have out of my head, so I tried to find it on the tinternet and here it is. Good old wikipedia. The big old Reflolux (top left) was the one I was talking about, not Rentokil. Incidentally, I also have the other meters on this picture in my back-catalogue. * suddenly the colour of the Bayer Contour TS and previous model of Accuchek Active makes sense: feeding on the nostalgic yearnings of Reflolux users?